DEADLINE FOR LIFT TICKETS IS 16 DAYS BEFORE YOUR ARRIVAL DATE! 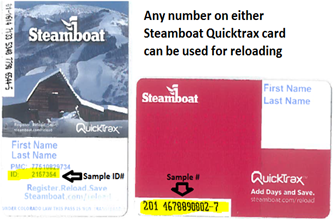 If you need lift tickets before May 7th, 2019 or experience technical difficulties with this website please visit Steamboat.com to purchase them. You must purchase 1 ADULT 5-DAY lift ticket to get 1 KIDS SKI FREE 5-DAY. There are no exceptions to this. TIP: If you are purchasing an ADULT 4 day and a Child (5-12 years old) 4 day, it could be cheaper to add another day to your ADULT ticket to get a KIDS SKI FREE for the CHILD ticket. If you would like different members of your group to pay for their own lift tickets make sure they have the correct Transaction ID and Full Name that the reservation was made under. This is the only way we know to bundle them all together when your group arrives in Steamboat. Full name that the reservation was made under. Email used for confirmation of lift tickets order. Transaction ID found in your lift ticket email from Retreatia that was sent when the reservation was made. Total number of lift tickets/people? Does this person already have a QuickTrax ID? KIDS SKI FREE: 12 and under with Adult 5+ Day Pass. Please review your order before submitting. Please select the checkbox to the left if you have completely reviewed your order and are ready to pay. No refunds will be rewarded unless the individual's injury has been logged by ski patrol and/or provide a doctors excuse.